Paste refers to the mixture or recipe of ingredients used in the production of a ceramic object, also known as the body. Before the 1760s, all porcelain made in France was artificial, or soft-paste porcelain. Only after 1765, when kaolin, the china clay required to produce ‘true’ or Oriental porcelain, was discovered near Limoges, did French porcelain manufactories begin to produce hard-paste porcelain. Being able to recognise these two pastes helps to identify the place of production or spot spurious pieces. Texture and colour are helpful tools, as are marks. Soft-paste porcelain, known as ‘pâte tendre’ in France, is artificial porcelain. It shares many of the features of ‘true’ or Oriental porcelain, transmitting light, a white body or paste, but it lacks the critical ingredient, kaolin or china clay, and can crack if exposed to boiling water. In France, artificial porcelain was commercially produced from the late seventeenth century at the Saint-Cloud manufactory, just outside Paris. It contained a glassy frit (calcined and ground to a powder), mixed with white clay and chalk. Objects were fired before glazing, when there was some shrinkage, and fired again when covered with a lead-glaze, sometime made opaque and whiter with the addition of tin oxide. The term ‘soft’ refers to the lower temperatures required compared to hard-paste porcelain. Soft-paste was an expensive process owing to the many losses resulting in sagging, firing cracks and blemishes. It was produced at Sèvres until 1804, when it was discontinued when hard paste was produced exclusively. Hard–paste porcelain, also known as ‘pâte dure’, is a ‘true’ or Oriental porcelain. It transmits light, the body is slightly greyish white and it can withstand boiling water. It comprises a combination of kaolin (china clay), quartz and feldspar. 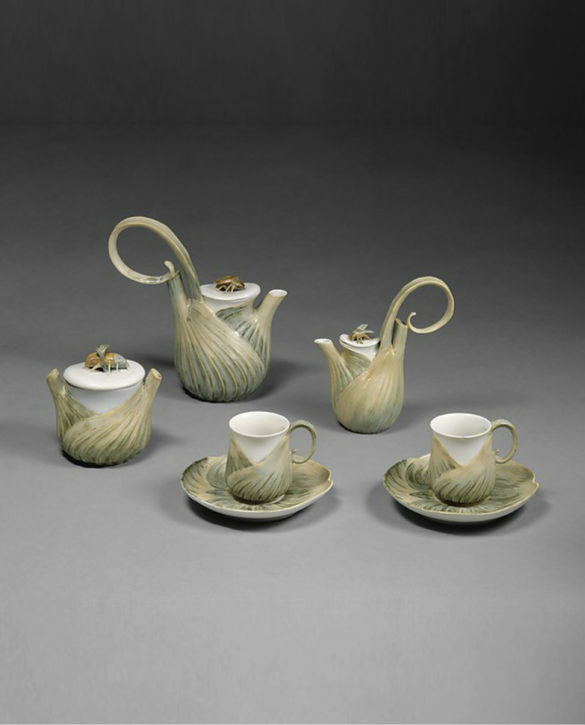 The first European hard-paste porcelain was manufactured in 1708 at the Meissen factory, in Saxony, near Dresden. Kaolin was first discovered in France, near Limoges, at Saint-Yrieix-la-Perche, in the mid-1760s. 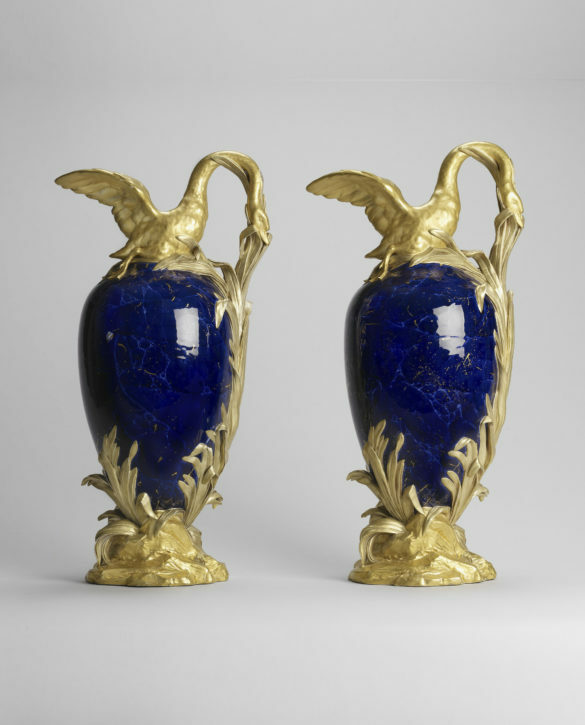 By late 1769, the Sèvres factory was successful in producing hard-paste porcelain. Both pastes were produced until 1804. However, the hard-paste was more economical and could withstand the higher temperature firings required for its production, hence it is referred to as ‘hard’ as it required high temperatures to fuse the materials. The term ‘biscuit’ describes porcelain, either soft-paste or hard-paste, which has been fired but not glazed. It refers either to unfinished pieces waiting to be glazed, or to completed unglazed figures and miniature vases on columns, often used for table decorations which were not intended to be glazed. The surface resembles sugar sculpture for the dessert table or statuary marble. The term, meaning ‘twice fired’, may refer to the initial firing of the frit, in the preparation of the clay and second firing once modelled. 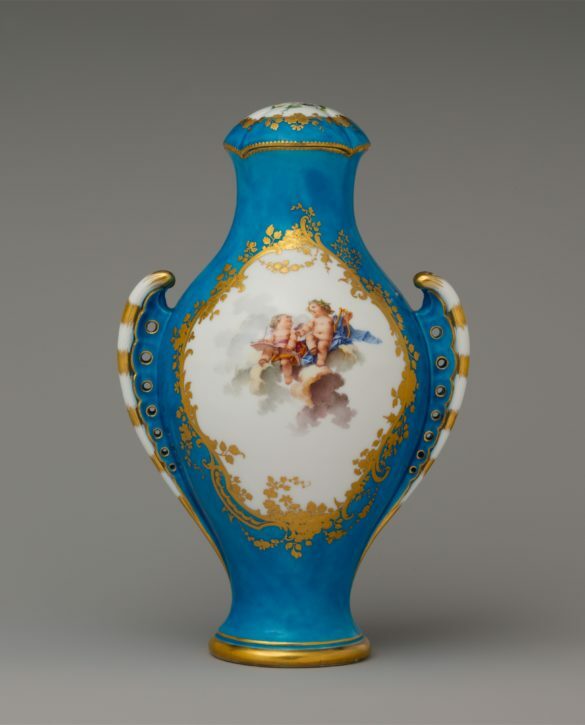 Towards the end of the nineteenth century, around 1882, the Sèvres factory experimented with other pastes or bodies. Among these was ‘pâte nouvelle’ (‘new paste’), a hard-paste porcelain, which could be fired at a lower temperature, and was therefore more economical and allowed different types of decoration. In 1965, another paste was invented, ‘pâte blanche ou pâte Antoine d’Albis’, a type of hard paste, named after the chief chemist at the Sèvres factory.